Cardston, Alberta--(Newsfile Corp. - November 26, 2018) - American Creek Resources Ltd. (TSXV: AMK) ("American Creek") ("the Corporation") is pleased to report that the final hole (CB-18-39) of the 2018 exploration season, a 90 m step-out to the north of the Copper Belle Zone, intersected 0.981 g/t gold over 563.8 meters including 1.15 g/t gold over 234 m and 1.72 g/t gold over 55.5m and bottomed in mineralization. This is the widest and most strongly mineralized interval seen to date of the 69 holes that have been drilled within the zone, and more importantly, suggests potentially greater widths of mineralization continuing to the north and northeast. This new extension will be a prime target for follow-up drilling in 2019. Hole CB-18-39 is one of the three holes reported here that were part of the nine-hole 2018 drill program on the Copper Belle zone of the Company's Treaty Creek property, in the "Golden Triangle" area of north-western BC (see map below). The Treaty Creek property is adjacent to and part of the same large hydrothermal system as Seabridge's KSM property and Pretivm's Brucejack / Snowfield property. Results of core sampling have now been received for all of the nine holes completed. The first six holes were reported in the August 24 and October 30 news releases. Walter Storm, President and CEO, stated: "This very positive intersection in the final hole of the year at Treaty Creek exhibits particularly strong gold values for a porphyry-style deposit. It is certainly the best result to date at Copper Belle - in terms of grade x length - being some 50% longer than the previous longest intersection. 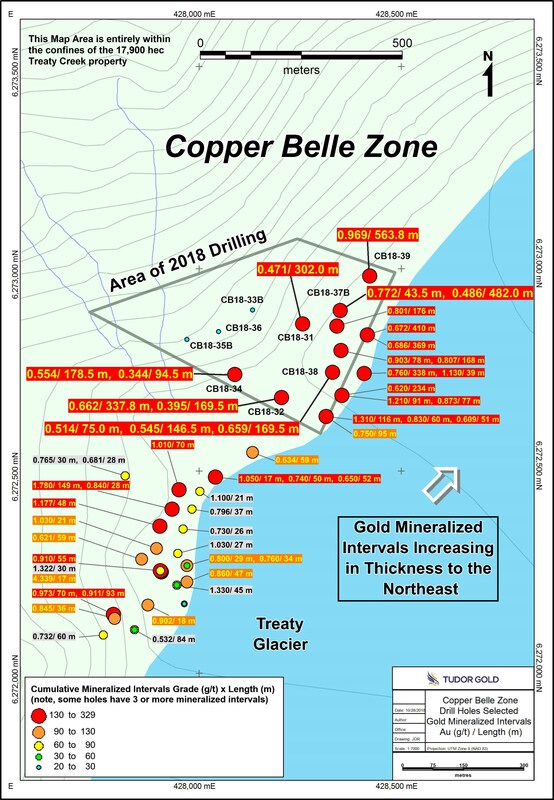 We drilled 9 deep holes in 2018, testing a large area with a wide-spaced drill pattern, a program which has expanded the Copper Belle zone to the north and northwest; discovering broad intercepts of gold mineralization adjacent to similar wide intercepts reported in 2017. The target next year will be more drilling north and northeast of Hole CB-18-39, expanding on the significant grade and scale of the gold mineralization encountered." * All assay values are uncut and intervals reflect drilled intercept lengths. CB-18-39 intersected mineralization from a depth of 141.5 m to the end of the hole at 705.3 m, averaging 0.981 g/t Au over 563.8 m. The hole also contained higher grade sections, such as 1.719 g/t Au, with 10.4 g/t Ag, over 55.5 m and, significantly, the hole ended in mineralization, grading 0.673 g/t Au over 38.8 m, indicating potential for continuing mineralization at depth. CB-18-39 was drilled northwesterly at an angle of -72 degrees. The host volcaniclastic rocks are typically chlorite, sericite and locally potassically altered, however the more strongly mineralized intervals exhibit increased pyrite and stronger silicification than surrounding rocks. This hole also displayed more chalcopyrite than was observed in previous holes. This may indicate that copper grades could be increasing to the north. 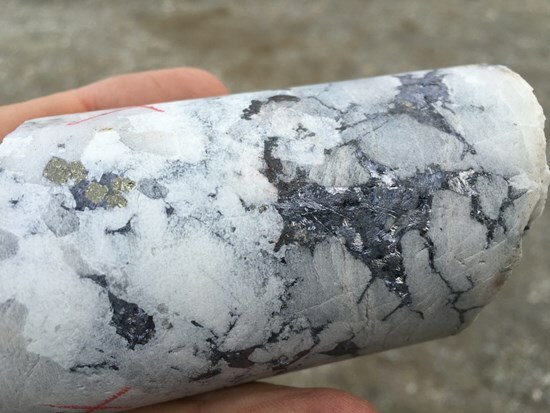 Silver values were also higher on average in hole CB-18-39, with sections such as 10.4 g/t Ag over 55.5 m from 569.0 m to 624.5 m.
Hole CB-18-39 is the northernmost hole drilled to date and has extended the length of the Copper Belle Zone approximately 90 m northeast from CB-18-37B, to a total known length of 1200 m. Hole CB-18-38; a fill-in hole in the east part of the drill grid, returned wide intercepts of gold mineralization similar to nearby previously drilled holes. Hole CB-18-36 was drilled at the west edge of the drill grid and gold-bearing intervals in this hole indicate that the zone continues at depth in that direction. Gold, silver and copper results for holes CB-18-38 and CB-18-36 are summarized in the table below. CB-18-38 was a fill-in hole located approximately 60 m and 140 m from the adjacent holes (see map below), providing important information about the width, grade and continuity of the Copper Belle Zone in this area. It was drilled to the northwest at an angle of -72 degrees, parallel to the adjacent holes, and returned three broad intervals of gold mineralization; 0.514 g/t Au over 75.0 m, 0.545 g/t Au over 146.5 m and 0.659 g/t Au over 169.5 m. Additional narrower intervals included 0.561 g/t Au over 19.5 m, as well as 0.540 g/t Au over 12.0 m, which extended to the end of the hole indicating that mineralization probably continues at depth. The gold mineralized intervals in CB-18-38 are primarily hosted by andesitic tuff and fragmental rocks that are moderately silicified, with chloritic, sericitic and potassic alteration, and are cut by abundant fine pyrite veins and later quartz-carbonate veins. Pyrite content averages about 5%, occurring as fine veins, disseminations and local coarse masses in the host rocks. Gold occurs primarily within the pyritic intervals, as well as within later quartz veins, along with rare chalcopyrite, galena and sphalerite. CB-18-36 was located at the west edge of the drill grid, and oriented to the northwest at an angle of -72 degrees. It intersected a wide zone of faulting and brecciation that has undergone sericite alteration, with overprinted strong silicification and abundant pyrite. This fault zone, plus underlying brecciated volcanic rocks, is mineralized over a drilled length of more than 140 m, and contains a more strongly mineralized gold zone averaging 0.760 g/t Au over a thickness of 46.5 m. Later quartz-carbonate veins containing pyrite, with lesser galena and sphalerite may also contribute to the gold grades. The nine holes drilled in 2018 covered an area measuring approximately 370 meters by 250 meters, to depths ranging from 600 to 900 meters. This area is located to the north and west of the area for which the company reported a range of 1.8 to 1.9 million ounces contained within 50 to 45 million tonnes grading 1.12 to 1.35 g/t Au determined from the drill results prior to 2018. The most recent drilling has now extended the known length of the porphyry-style mineralized system for over 1200 meters. For locations of the 2018 and other holes in the Copper Belle area please view the map below. The Copper Belle zone has an elongate north-northeast trend, dipping at a relatively flat angle to the northwest. Mineralization appears to be related to an extensive north-northeast trending tectonic zone that may be part of the extensive Sulphurets Thrust Fault structure that also traverses the KSM property to the south. The objective of the 2018 drill program was to better define the extent of the Copper Belle zone. The results from the 2018 holes have provided additional information about continuity and grade of mineralization that, along with the previous drill results, will be integral for a resource calculation. Darren Blaney, CEO of American Creek stated: "Drilling has continued to show long intervals of one-gram gold including lenses of higher grade within. The mineralization is open at depth and to the north-north east just as indicated by the geophysics, which also indicates that we're only scratching the surface of highly prospective areas on Treaty Creek. What has been rewarding is that the geology and geophysics, both similar to Seabridge's KSM and Pretivm's Snowfield, have been used together to guide the drill to such exceptional results." Drill core samples were prepared at ALS Global's (independent) Preparation Laboratory in Terrace, BC and assayed at ALS Global's (independent) Geochemical Laboratory in North Vancouver, BC. Analytical accuracy and precision are monitored by the submission of blanks, certified standards and duplicate samples inserted at regular intervals into the sample stream by Tudor Gold personnel. ALS Global Laboratories quality system complies with the requirements for the International Standards ISO 17025: 2005. The Qualified Person for the Treaty Creek results in this new release is James A. McCrea, P.Geo., for the purposes of National Instrument 43-101. He has read and approved the scientific and technical information that forms the basis for the disclosure contained in this news release. The Corporation reports that the previously announced exploration/drill program on the Gold Hill project located in the Wildhorse (Boulder) watershed in SE British Columbia is still underway and is proceeding as planned. Core is being logged, split and sampled and the first batch of samples is expected to be shipped to the assay lab this week. American Creek holds a strong portfolio of gold and silver properties in British Columbia. Three of those properties are located in the prolific "Golden Triangle"; the Treaty Creek and Electrum joint venture projects with Tudor (Walter Storm) as well as the 100% owned past producing Dunwell Mine. The Corporation also holds the Austruck-Bonanza, Ample Goldmax, Silver Side, and Glitter King properties located in other prospective areas of the province. Certain statements contained in this press release constitute forward-looking information. These statements relate to future events or future performance. The use of any of the words "could", "intend", "expect", "believe", "will", "projected", "estimated" and similar expressions and statements relating to matters that are not historical facts are intended to identify forward-looking information and are based on the Company's current belief or assumptions as to the outcome and timing of such future events. Actual future results may differ materially. All statements other than statements of historical fact included in this release, including, without limitation, statements regarding potential mineralization and geological merits of the Treaty Creek Project and other future plans, objectives or expectations of the Company are forward-looking statements that involve various risks and uncertainties. There can be no assurance that such statements will prove to be accurate and actual results and future events could differ materially from those anticipated in such statements. Forward-looking statements are based on a number of material factors and assumptions. Important factors that could cause actual results to differ materially from Company's expectations include actual exploration results, changes in project parameters as plans continue to be refined, results of future resource estimates, future metal prices, availability of capital and financing on acceptable terms, general economic, market or business conditions, uninsured risks, regulatory changes, defects in title, availability of personnel, materials and equipment on a timely basis, accidents or equipment breakdowns, delays in receiving government approvals, unanticipated environmental impacts on operations and costs to remedy same, and other exploration or other risks detailed herein and from time to time in the filings made by the Company with securities regulators. Although the Company has attempted to identify important factors that could cause actual actions, events or results to differ from those described in forward-looking statements, there may be other factors that cause such actions, events or results to differ materially from those anticipated. There can be no assurance that forward-looking statements will prove to be accurate and accordingly readers are cautioned not to place undue reliance on forward-looking statements.